The Pennsylvania eviction notice forms are the first step a landlord has to take in order to begin an eviction process. A landlord must provided the required notice and wait the required amount of time before seeking assistance in the Local Magisterial or Municipal Court. Once the notice period has expired, landlord may file a Complaint and receive a hearing date. The Complaint will then need to be served on tenant. If, after the hearing or if tenant fails to show up at the hearing, the judge issues a judgement in favor of the landlord, the landlord can ask the court to issue an Order of Possession, which will require tenant to move out within fifteen days or be forced out of the premises. 10-Day Notice to Quit (Non-Payment) – This notice is to inform tenant that they are behind in their rent and that they have ten days to either pay the outstanding amount or vacate the premises. 10-Day Notice to Quit (Illegal Drugs) – This form is for use when a tenant has been engaging in the use of illegal drugs. 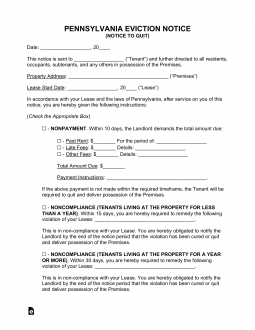 15/30 Day Notice to Quit (NonCompliance) – This form is for use when a tenant is violating the terms of the lease other than non-payment of rent. The fifteen (15) days is for tenants that have been on the property a year or less and the thirty (30) days is meant for those that have been renting for over a full year. 30-Day Notice to Quit (Month to Month Tenancy) – There is no State requirement for how much time a landlord or tenant is to be given for terminating a tenancy at will. Therefore it should be the required time in the lease contract or the standard norm of thirty (30) days. Rent is due on the date specified in the lease. Landlord may give notice to tenant that he will seek further action if the tenant doesn’t pay within ten days of the notice. Step 2 – If tenant fails to respond appropriately to the notice provided by landlord, landlord may then go to court to seek to have tenant evicted. Landlord must go to the court in the county or municipality in which the property is located. Use the Court Directory and the Landlord will then need to file a Complaint. The court will set a hearing date after it has been filed. Step 3 – At the hearing, both sides will have a chance to present their case. If there is a judgment in favor of the landlord, landlord can seek an Order of Possession after ten (10) days, which will require tenant to move out within ten days or be forced out of the premises. Recover the Lease from your files then download the “Pennsylvania Notice To Quit Form” which is accessible through the PDF, ODT, or Word buttons underneath the file image. Some information required by this form must be retrieved from the Lease. Each individual targeted by this Notice must have his or her Name recorded on the first blank line. The first statement will require the reported Location of the Property. This may be found on the Lease. Utilize the spaces after the terms “City of,” “County of,” “Zip Code,” “…number and street,” and “Apt.” to enter the City, County, Zip Code, Building Number/Street, and Apartment where the Leased Property is located. This Notice, as with many documents and procedures, will identify the Lease it concerns using the Signature Party’s Signature and the Signature Date. Report the Signature Date in the second statement. The spaces available for this will provide for the Date to be written out so make sure to enter the Calendar Day, Month, and Year of the Lease’s Signature Date in the correct space. This notice contains six subjects to choose from. The subject of this document will constitute what its Recipient will be informed of and what is expected by its issuer. Select one of the first five statements if you are a Landlord. If you are a Monthly Tenant, select the sixth check box. The “Nonpayment” statement will assume the subject matter to be the Recipient’s neglect in paying his or her rent to the Landlord. This statement will give its recipient an ultimatum: Pay the Past Due Rent Amount or return possession of the Leased Property to the Landlord/Agent. There will be several blank spaces in this statement – each demanding information to be supplied. If issuing this Notice, supply the Authorized Agent’s Name, the Amount of Money the Recipient owes, the minimum Dollar Amount that must be paid, and the Rental Period the Landlord/Agent is demanding to be paid. The “Noncompliance (Tenant on the Property 1 Year and Under)” statement will assume the subject matter to be the Recipient’s noncompliance or disobedience in terms of the Lease Agreement. If issuing this Notice, you must report the offense the Recipient is guilty of. This statement may only be selected if the violating Recipient has been on the premises for less than One Year and will give the Recipient Fifteen Days to correct this situation or release possession of the premises to the Landlord. The “Noncompliance (Tenant on the Property Over 1 Year)” statement will assume the subject matter to be the Recipient’s noncompliance or disobedience of the Conditions and Requirements of the Lease Agreement. This Notice may only be issued if the Tenant has been on the Property for more than one year. It will give the Recipient Thirty Days to correct the transgression or leave the Premises. You will need to report the breach of terms on the blank line provided. The “Illegal Drugs” statement will assume the subject matter to be the Tenant’s involvement with Illegal Drugs. Report this fact on the blank line. This statement will give the Recipient Ten Days to vacate the Property so the Landlord may repossess it. The “Month To Month Tenancy” statement from the Landlord will assume the subject matter to be the Termination of a Monthly Rental Agreement. The last day the Monthly Agreement is valid must be reported using the blank spaces in this sentence. This document must provide Thirty Days’ Notice to the Recipient Tenant before the end of the Monthly Lease occurs. The “Month To Month Tenancy” statement from the Tenant will assume the subject matter to be a Month To Month Tenancy the Tenant intends to terminate. The Date of this Termination must be reported in the statement provided and must be at least Thirty Days’ from this paperwork’s receipt by the Landlord. Locate the “Landlord/Agent Signature” line. The Landlord or Agent issuing this Notice must Sign this line. The Delivery of this document must be verified by the Agent acting as the Deliverer. This induvial must supply the Date of Delivery and Recipient in the first statement’s blank spaces. Then he or she must indicate how Delivery was effected by selecting the applicable check box statements. Finally, the person effecting this Delivery must Sign his or her Name on the Signature Line.